A couple of weeks ago, I was invited to a potluck at a friend’s house, and though I am not a big fan of potlucks from a culinary standpoint (the dishes rarely complement one another, which is something I spend my work days trying to achieve), I agreed to go because I always enjoy spending time with my friends. 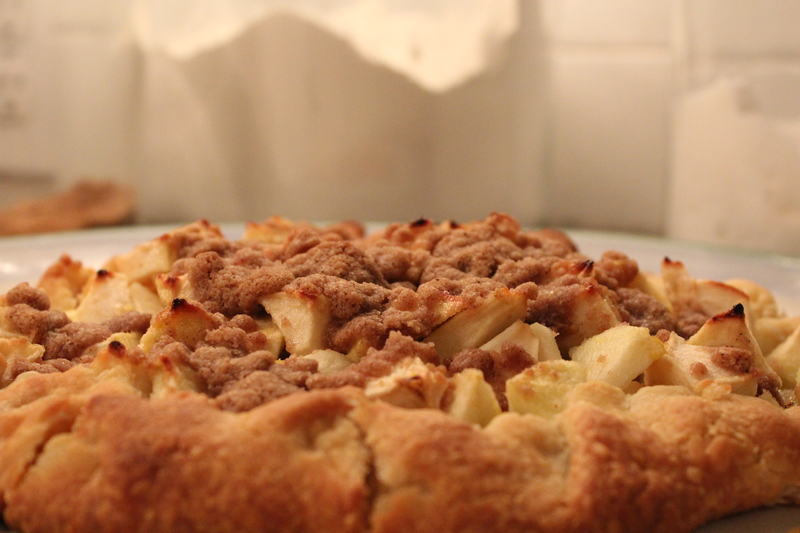 I decided to make this crostata–essentially a free-form pie, or a tart made without a pan–for dessert, in part because I had some apples at home that needed to be used and also because it is a lovely fall dessert that goes with almost everything. Place flour, sugar and salt in the bowl of a food processor fitted with a steel blade. Pulse a few times to combine. Add butter and pulse 12 to 15 times, or until the butter is the size of peas. With the motor running, add ice water all at once through the feed tube. Keep hitting the pulse button to combine, but stop the machine just before the dough becomes a solid mass. Turn the dough onto a well-floured board and form it into a disk. Wrap with plastic and refrigerate for at least 1 hour. Peel, core and cut the apples into eighths. Cut each wedge into 3 chunks. Toss the chunks with the orange zest. 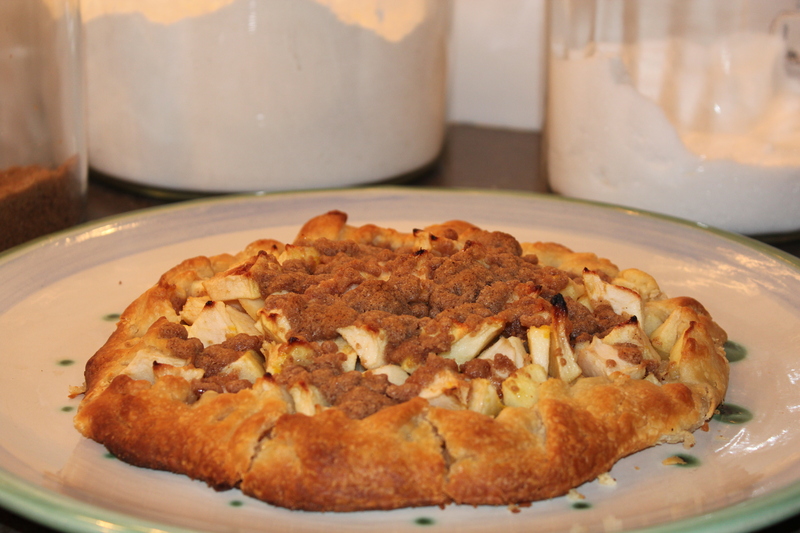 Cover the tart dough with the apple chunks leaving a 1½-inch border. Combine flour, sugar, salt, cinnamon and allspice in the bowl of a food processor fitted with a steel blade. Add butter and pulse until the mixture is crumbly. Pour into a bowl and rub it with your fingers until it starts holding together. Sprinkle evenly on the apples. Gently fold the border over the apples to enclose the dough, pleating it to make a circle. Bake for 20 to 25 minutes, until the crust is golden and the apples are tender. Allow to cool and serve warm or at room temperature. Recipe adapted from this one, from Ina Garten’s Barefoot Contessa Parties! cookbook. This entry was posted in Desserts, Recipes and tagged apples. Bookmark the permalink.